It’s clear this deco mesh craze is popular and not going anywhere any time soon. 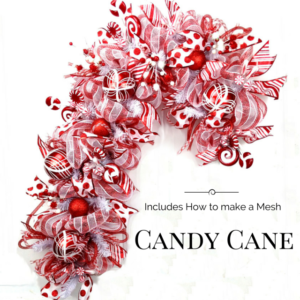 With my ebook, Learn Deco Mesh Wreath Design, you will be making beautiful wreaths in no time. 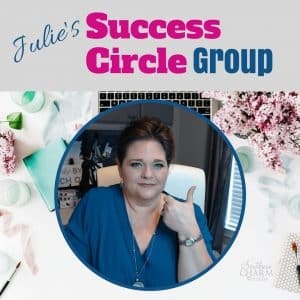 PDF ebook comes with several videos, retail pricing sheet, how to ship bonus, access to private Facebook Group and wreath recipes. Join the Deco Mesh Craze and Learn To Make Deco Mesh Wreaths! Now YOU too can make fun & funky PROFESSIONAL deco mesh wreaths for fun or profit! It’s clear to me now, that the deco mesh craze isn’t going anywhere and DIYers want to learn how to use it. I still get emails daily of fans asking me how to make my popular deco mesh wreaths. Just like me when I started, they’re having problems getting their loops just right and making a circular base and they’re not sure what to do after they do get it. They’re having problems attaching flowers securely so they don’t pop off when the door is slammed. Plus, just like me when I started, where to find the RIBBON and wreath making supplies. Can you relate? I mean…look at my first ever deco mesh wreath. I’ve come a long way don’t you think? 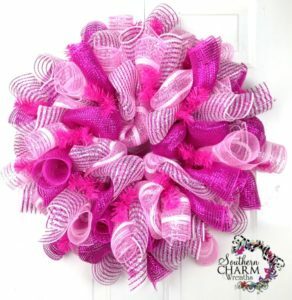 If you want to make wreaths for your own door or to sell, deco mesh wreaths are a great place to start. They’re a lot easier to master than silk flower wreaths and they give a huge punch of color to your door. Plus deco mesh wreaths are hip, modern and whimsical where silk flower wreaths are more traditional, don’t you agree? I’ve been making deco mesh wreaths for many years now and still to this day, the wreaths that sell the fastest from my shop are my deco mesh wreaths. Buyers just can’t seem to get enough of them. When I decided that I couldn’t keep up with demand a few years ago, I knew I had to teach others my secrets for making professional deco mesh wreaths and I’m so glad I did. This ebook has been a true blessing to me. I’ve met thousands of wreath lovers just like me and we still chat daily in the private Facebook group. What is this Craze–Deco Mesh? Discuss the different styles, patterns, colors, prices and uses. Which Wreath Base? Learn about the different wreath base options and learn to secure mesh in each form, including: Wreath Forms, Grapevine Wreaths, Box Wire Frames and Straw Wreaths. Step-by-step Instructions! Detailed pictures and explanation guiding the reader through designing the mesh wreath pictured above in this listing, including: Securing Mesh to the wreaths, Adding Ribbons, Adding Artificial Flowers, Securing Ornaments and Adding Signs. Where can I buy Deco Mesh Wreath Supplies? A list of vendors found in retail stores and online shops supplying Deco Mesh wreath materials. How to take Pictures of Wreaths? Photo taking tips for listing wreaths online or to remember your talents. 1.Full Access to our Learn Deco Mesh Wreath Design Facebook Group. 2. eGuide Beginners Guide to Designing Deco Mesh Garlands! Step-by-step eGuide demonstrating how to make deco mesh garlands and their many uses. Plus an example of making a matching mailbox bow! This eGuide is 18 pages with over 50 pictures. 3. Spreadsheet helping you calculate your wreath cost for selling retail if you ever decide you do want to sell your wreaths. 4. Report on How to package your deco mesh wreath for shipment! Whether you want to make wreaths to sell online for a profit or make a wreath to ship to Grandma and Aunt Jane as a gift to mail, these instructions for packing wreaths for shipment will be what you need. 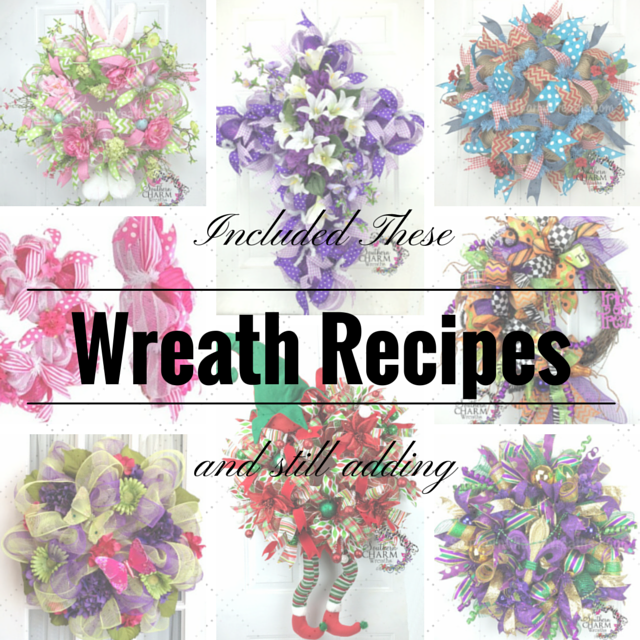 Some written instructions and some video instructions for making 8 additional wreaths in what I like to call “Wreath Recipes”. 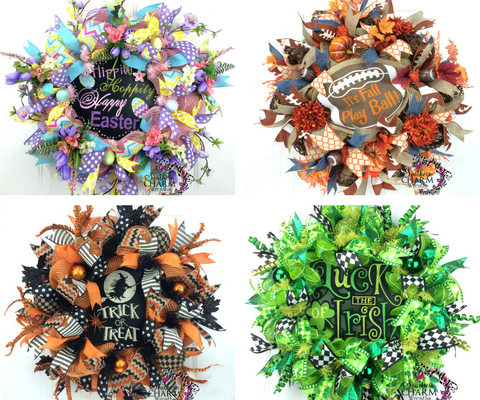 There is a cross wreath, elf wreath, Mardi Gras wreath, spring wreath, funky bow Halloween wreaths, screen door wreath and patriotic wreath! 6. 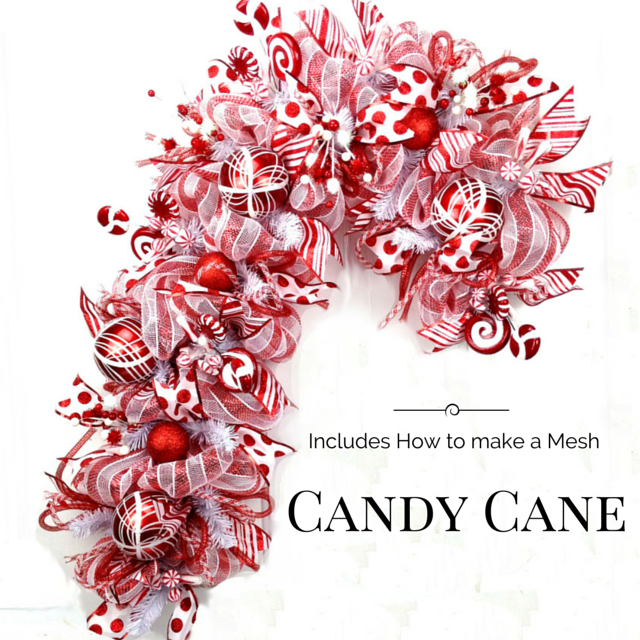 Candy Cane Wreath instructional video. 7. A full hour long Deco Mesh Burlap Fall Wreath instructional video. 8. My popular curl and loop wreath style base that I use on most of my deco mesh wreaths. I know you can make deco mesh wreath just as well (or not better) than I do by using my instructions! They look difficult to make but you will be surprised at how easy they are to master. And won’t your neighbors be envious seeing your gorgeous new wreaths on your door! How shocked will they be to learn YOU MADE IT! 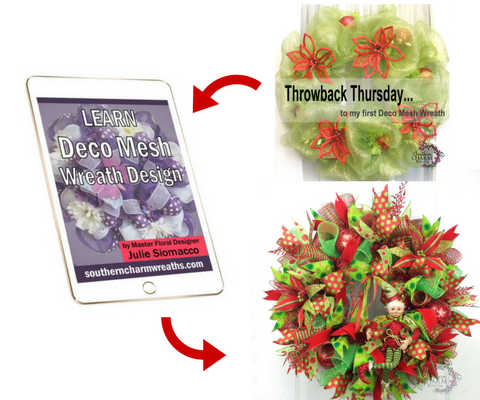 I am so confident that you will learn from my eBook how to make a deco mesh wreath; I am offering you, a very generous, 60 days to use this eBook. That’s right, there is NO rush…try my eBook out at your leisure. This gives you plenty of time to order your materials online or find them in your local stores and make your own beautiful deco mesh wreath. If you don’t find yourself making simply gorgeous wreaths, then I’ll cheerfully give you a full refund with no hard feelings and everything I sent you is yours to keep. There are no shipping fees! These ELECTRONIC files will be made available to you after purchase. Unfortunately, these items can not be divided and sold separately. You will need the FREE Adobe Acrobat Reader loaded onto your computer to be able to read the ebook and materials. You can transfer the pdf files to an ereader such as Nook or iBooks. All of this detailed information for less than $40! Another holiday is just around the corner and deco mesh is easy to use both indoors and out!